For all, who have started learning RoR and for those who are into this, here are some of the facts and conventions that you can follow, to make your Ruby code more shorter and easy to understand. 2. How to Improve the performance of any method inside your controller, if it is taking much time rather than the expecting. Now here suppose these queries returns data in a heavy size, definitely it will gonna take time to load, so how we will improve the performance in this case? 3 How to update ruby 1.8.6 to 1.8.7 or 1.9? This makes me frustrated most of the times. I am having Ruby 1.8.6 as a stable version on my system. Now I want to update it to 1.8.7 so that I can sense Rails 3.0 and its features, but most of the sites and blogs are giving instructions to install it as a fresh copy and most of the sites are giving information that 1.8.7 is not compatible with rails 2.1 or higher. Now, for most of the programmers, consider a scenario where multiple models has 1 to N relationship with one model. To make it more easier lets take 1 example. 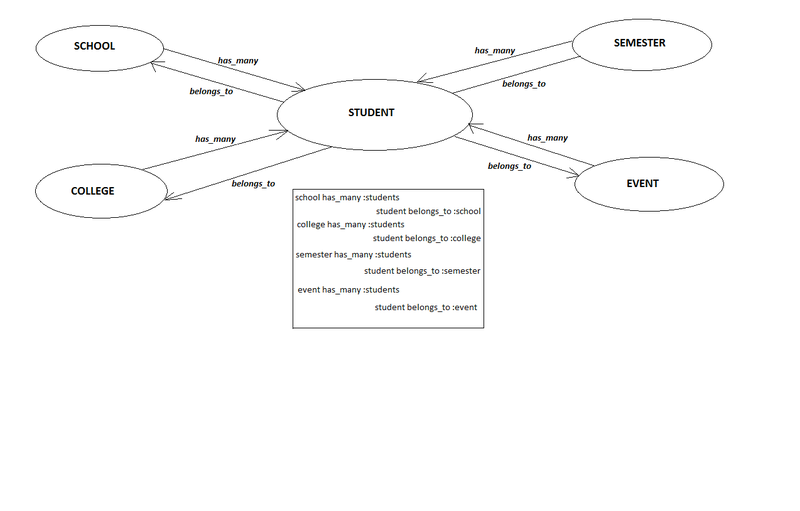 Where models like School, College, Event and Semester are having multiple relationship with a single model i.e Student. Do you think, our student model will have foreign keys like school_id, college_id, event_id and semester_id? Will it be a good idea to have multiple foreign keys into one table? So, what is the advantage here to use as association and polymorphic is, you don’t need to create school_id, college_id, semester_id and event_id columns in the students table. So when you create migration, you’ll have to create two columns i.e. So for example colleges the entry will have rollable_id as specific college id and rollable_type as “College”. How simple and short implementation, isn’t it? Well this is way good approach of doing this.. Thanks for sharing… I am putting more facts, so I will be looking out more and more responses.. In my view, would say that if we will do more Indexing with needful tables & also on the relation table then you will get auto increased performance of related queries result..! Then probably no need to do much work in coding..